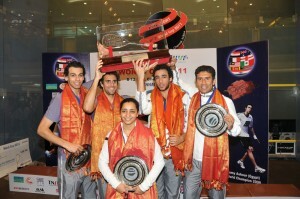 Egypt justified their billing as top seeds in the 2011 JSW SDAT WSF World Cup by beating second seeds England in today’s final of the World Squash Federation mixed team championship to win the $50,000 top prize at the Express Avenue Mall in Chennai, India, for the first time. The event, in its first of three years in Chennai, reached its climax on an all-glass showcourt sited in the central atrium of the Express Avenue Mall, the largest shopping complex in southern India in which crowds on four floors were able to witness the world-class action. 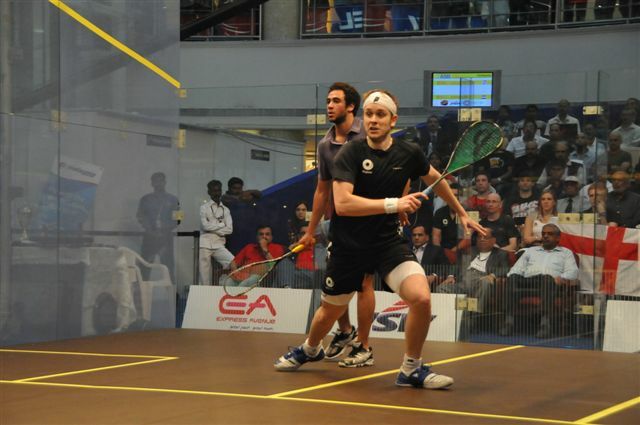 First to do battle in the eagerly-anticipated climax between two of the world’s greatest squash nations were Cairo-based Ramy Ashour and Englishman James Willstrop, ranked two and four in the world, respectively. The match lived up to its expectations – with Ashour, a former world No1, extending his career-long head-to-head record against Willstrop to 12/4, winning 11-8, 11-7, 11-7 in 37 minutes. Despite having to withdraw midway through her semi-final match yesterday with a groin niggle, Jenny Duncalf was determined to justify her team selection against Egypt’s Raneem El Weleily. 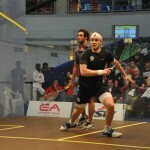 The world No2 dropped the first game, but battled back to draw level against El Weleily as the England camp hoped for a third string decider. But as Duncalf’s injury began to take its toll, so the lower-ranked Egyptian increased her determination to win – doing so in convincing fashion by an 11-8, 7-11, 11-9, 11-1 margin. Ashour was thrilled with the team’s win: “It’s moments like this that make you feel proud to be Egyptian. We are very, very proud of what we have achieved. “After all the troubles we have had in our country, the nation’s pride is now getting bigger. Everyone back home was desperate for us to win – we really needed this win. The illustrious 23-year-old agreed that he had been under pressure: “But sometimes pressure is a positive thing. I wanted to use the pressure in a positive way – I think the motivation I have, and the pressure, pushed me in the right way. Raneem El Weleily, the world No12 who followed her upset over Australia’s world No3 Rachael Grinham in the semi-finals by recording her first ever win over Duncalf, was delighted with her World Cup run. 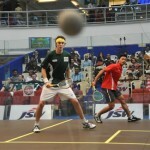 Earlier, third seeds Australia collected the bronze medal after beating Malaysia, the fifth seeds, 2/1. Supporting the Malaysians was a distinguished VIP group led by the Deputy Prime Minister of Malaysia, The Honourable Tan Sri Muhyiddin HJ Mohd Yassin, and HE Dato’ Tan Seng Sung, the High Commissioner of Malaysia to India, with Mr Anuar Kasman, Consul General of Malaysia in Chennai. 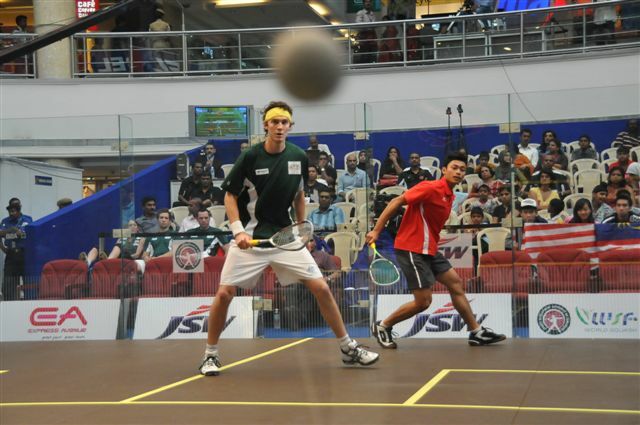 Cameron Pilley, the world No14 who has led the three-player squad which has taken the Aussies through the event, beat put the third seeds into the lead with a commanding 11-4, 11-5, 11-4 win over the Malaysian top string Muhd Asyraf Azan. But the biggest cheer of the day from the packed Mall crowd greeted Malaysia’s world number one Nicol David as she entered the court for her match against long-time rival Rachael Grinham. It was the pair’s 36th meeting since 2000 – but, much to the delight of the crowd, and the guests in the front row of the VIP seats, David beat former world number one Grinham 8-11, 3-11, 5-11 to level the tie. In a convincing performance in the decider, Tasmania-born Aaron Frankcomb beat Kamran Khan 11-6, 11-6, 11-3 to put Australia in the medals. “It was an excellent team performance,” enthused Australian coach Byron Davis. “Cameron gave us a good start and didn’t give his opponent a chance, and Rachael played well particularly after a series of tough matches through the week. Championship Director Major Maniam was delighted with the success of the event: “After being involved with the firstWorld Cup in Kuala Lumpur in 1996 as coach and organiser, I got hooked on this event. I sincerely feel that this is one of the best team events you can think of – with men and women combined. “The WSF must aggressively pursue this so that more countries participate in future events. I believe that the WSF should also consider the idea of a Junior World Cup, which would perfectly complement the senior event. 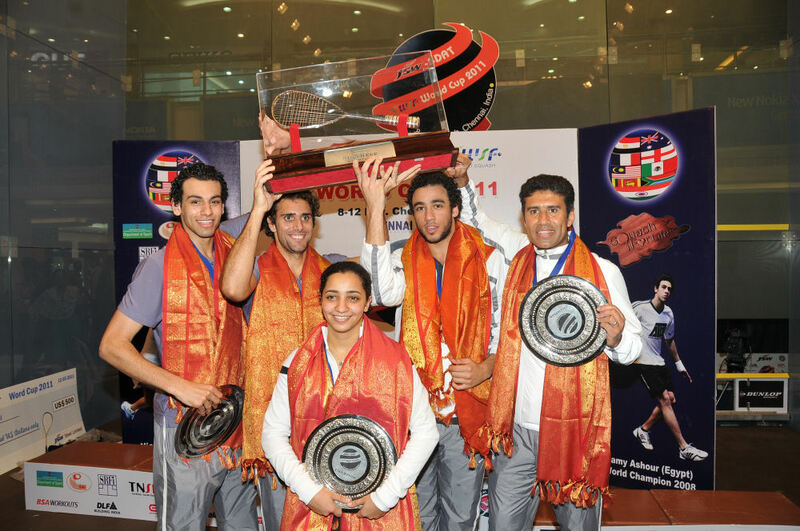 “We are most grateful to our title sponsors JSW Steel – and we must acknowledge the excellent support we have received from the Tamil Nadu Government, the Sports Development Authority of Tamil Nadu (SDAT) and the Squash Rackets Federation of India. Together, we have been working tirelessly towards this event for the last three months – which is why I am able to sit here now, basking in the event’s success. World Squash Federation President N Ramachandran was also pleased with the outcome: “The 2011 World Cup here in Chennai has been a tremendous success – one couldn’t have wished for more. I am sure that further events held at this venue will be even more successful. In conclusion, WSF CEO Andrew Shelley added: “World Cups are synonymous with the very best. The top cricketers are playing theirs at the moment, and the world stops for football’s. Ours may not command quite the same level of media attention as the other two, but we have an ingredient they do not – mixed teams. “It’s a great format which, following on from the success here in Chennai, will mean that the next is even more eagerly awaited.